Five months before her wedding day, Karen Meek Eric shocked to hear confessions, fiancée. Eric said that he had become a Muslim. Recognition was like lightning in broad daylight for Karen is like any other Russian citizen, did not adhere to any religion, aka atheist. "I think he (Eric) has suffered brainwashing. Suddenly he stopped drinking alcoholic beverages. He prayed five times a day and no longer want to eat pork, "the story of his fiancee Karen about behavior change. While Eric, who was originally a Christian Baptists, but later became an atheist, for months to study Islam without telling her, until finally he decided to become a Muslim. Despite the shock she still wanted to continue the wedding plans with Eric. Karen then look for a variety of references, ranging from books to videos about Islam, to understand the new religion professed her future husband. But he did not expect to convert to Islam. "I grew up with the mindset that religion is something that stupid. I do not believe in God. I do not think about how the world was created, and frankly, I do not care, "said Karen. But she acknowledged that Islam provides the most logical explanation about God and the creation of the universe and it is difficult for Karen denied. Karen finally married to Eric. He continued to study Islam and for the first time he tried praying, while her husband worked in the office. He studied his own prayers from a book. "Up to this point, I do things quietly. I'm not the story on Eric. I do not embrace the religion just because my husband embrace a religion. I want to find my own way, "said Karen. "As an atheist background, I am more receptive to Islam than a Christian, because in this case I do not need to remove any religion," he continued. 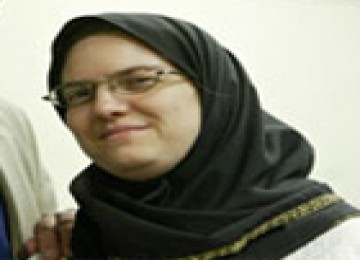 Karen and her husband started meeting with the Muslim community to learn the Koran. Until finally, she resolved to follow her husband converted to Islam. Karen was saying two sentences creed and officially became a Muslim. But the choice makes her parents surprised her. "One day, it comes with wearing long dresses and headscarves. I was surprised she made, "said Karen's father, Ray Alfred. Alfred claimed to feel strange to see her daughter at the time and he was worried about her safety during the attacks of 11 September 2001 in the U.S..
"You want to love your child, but when they do something that is unfamiliar to you. It is very difficult, "said Alfred," I would give anything as long as he does not embrace the religion (Islam). " Karen's mother expressed a similar comment, which frankly says that he does not like the veil that used his daughter. "Karen is a beautiful girl with beautiful hair," said Jane Barrett. Karen understand the anxiety of his parents heard he had become a Muslim and wearing Muslim fashion. Because himself admitted it took months before he decided to veil. "I only wear the hijab if going to places that I do not think there will be people who know me," Karen said with a laugh. But now, she always wore a headscarf wherever she goes, including to his workplace where he worked as a staff accountant at a restaurant chain. Karen says, Islam has made him see life in new ways. "From one who does not believe God to be people who believe in God, it feels incredible. Islam opened my eyes to many things that I had been ignored. Mainly, that life is a gift, "said Karen closes her story.